The Gravely® Pro-MasterTM 260 is now available with a rear discharge deck, meeting a growing need for commercial and government contractors. The new deck is ideal for mowing near obstacles, as clippings are diverted behind the machine, instead of out the side. The mower features a 60-inch cutting width, 13.4-gallon fuel capacity and 13 mph ground speed. 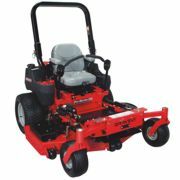 The Pro-Master is powered by a 27 HP Briggs & Stratton Daihatsu Diesel engine. The 60-inch deck is based on the seven-gauge X-Factor® deck currently found on Gravely's side discharge model. Acu-Trol now offers a multifunctional full equipment room controller. The AK600TM includes up to 16 output relay combinations, configurable for six types of control. The AK600 can be customized for any facility, with voltage-configurable control relays and bidirectional control, database information options accessible via direct link, dial-up, modem and Ethernet connectivity. With control of chemicals, pumps, filters, heaters, air handlers, chloramine reduction systems and the ability to interface with building management systems for up to three bodies of water. Ideal for aquatic facility managers looking for maximum control of their facilities to reduce cost by reducing usage. The AquaPill Complete Pool Care® offers users an "all-in-one" water treatment system designed to save time and money. Its patented release delivery system is designed so users never have to measure or store chemicals. Simply place the pill within the skimmer and the unit automatically dispenses its contents. 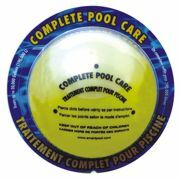 The Complete Pool Care® AquaPill is designed to remedy the most common pool water issues—from removing oil and scum and clarifying cloudy water to removing excess metals, grime, oil and organic debris from filters. The product is an enzyme-enhanced, all-in-one clarifier, odor eliminator, filter degreaser, metal inhibitor and much more. Water Tech announced a battery-operated cordless and hoseless power vacuum cleaner called the Pool Blaster Aqua BroomTM . Powered by five D-cell batteries, it runs up to three hours at a time and filters up to 25 gallons of water per minute with a high-flow vacuum motor. Lightweight for use by hand or attached to any standard telescopic pole for extended reach. An easy-grip handle is perfect for step, stair and surface cleaning and has a built-in hanging storage notch. The Aqua-BroomTM removes leaves, sand, acorns, hair, bugs and disease and disease causing debris. Rescue Klear was designed to address tough pool water problems. Rescue Klear blends a powerful enzyme and a natural clarifier to quickly and effectively clean up oils from bathers and vandalism, as well as dead algae. Suntan oils, lotions, recreational toys and algae can cause build-up on the water line or in the filter media. SeaKlear Rescue Klear battles the problem using enzymes to naturally degrade the oils and lotions coupled with SeaKlear's proven, highly effective, natural clarifying biopolymers to clear the water and allow the filter to remove pollutants effectively. Witt Industries' popular, stylish Covington Collection and economical Expanded Metal line combine durability and functionality to deliver long-term value. Durable yet decorative, the 40-gallon Covington receptacles feature a classically patterned laser-cut design that is manufactured from 10-gauge galvanneal steel, which is powder-coated in "recycle blue" and topped with a flat lid that allows single stream collection. Manufactured of expanded metal with vertical and horizontal ribbing for reinforcement, economical Expanded Metal recycling containers are available with a flat-top lid with openings to allow for single stream recycling. NORDOT® Adhesive #34P-4 from Synthetic Surfaces Inc. is a new, one component outdoor adhesive that was designed to install and/or repair synthetic turf and other outdoor surfaces in widely variable and sometimes hostile weather conditions. It fills the need for a versatile adhesive, which allows the outdoor installation and repair season to expand from "fair weather" days to year-round. Surfaces that benefit are playgrounds, athletic fields, landscaping, rooftops, golf, airports and lounging areas. Fabcote now offers a complete line of ladders including options for white or gray powder-coating to match aquatic facility décor and protect against corrosion. Fabcote's state-of-the-art, in-house powder coating facility produces an exceptionally durable finish to resist corrosion. The surface of the ladder is evenly coated using an electro-static process that drives the coating material into and around all surfaces. Fabcote ladders are made of high grade 304 stainless steel.